Even as they pick the last bits of the country’s privatized economy off the auction block, German investors show no sign of losing interest. Negotiations for the sale have been protracted, not least due to the fact that Deutsche Bank, through its stake in České radiokomunikace, is already a significant shareholder in mobile operator T-Mobile, the chief opponent to its intended new investment, Eurotel. Above and beyond mobile, says Gole, there remains the problem of having stakes in fixed-line carriers and possible future competitors Contactel and České radiokomunikace. Deutsche Bank is expected to sell Eurotel to a major European player soon after purchase, which would take care of one conflict of interest. Still, according to National Property Fund spokesperson Lucie Králová, it must obtain a purchase permit from the Antimonopoly Authority in order to complete the deal. As for Contactel, it may well be absorbed by a division of Czech Telecom. Spokespeople for Deutsche Bank declined to comment on any details. Statistics of late seem to belie Jahn’s claim. But what has propped up the German numbers is a large-scale shopping trip through the country’s most attractive bits of privatized infrastructure. German firm RWE settled on a premium price for the country’s gas sector (Transgas and distributors) of EUR 4.1 billion (CZK 133 billion), and thus became the second-biggest pipeline operator in Europe. This caused the total amount of German foreign direct investment for the first half of 2002 to balloon to an extraordinary 4.47 billion Euros, some 75% of the total from all countries. Apart from the purchase of gas, German investment compared to Asian was EUR 370 million to EUR 106 million. And the greenfield investment by Toyota with Peugeot/Citroe¨n, at EUR 1.5 billion, should further level the interests of Asia and Germany by the end of this year. Utilities are only one piece of the Czech privatization pie that is just now offering up its sweetest pieces; Telecom seems the next to go. Monopoly operator Czech Telecom, too, has a German suitor in Deutsche Bank. Though negotiations have seemed drawn-out, leading many to speculate that Deutsche Bank is pressuring the government to lower its already considerably low price (EUR 1.82 billion for a 51% stake), others point out that the extremely complicated nature of the deal could alone account for a delay. Interestingly, all of this good news about German money flooding the country comes on the heels of consistently incongruent bad news regarding the German economy. Chronic problems with unemployment there seem to bode pressure to keep investment and jobs inside of the borders. Not the case, says Andreas Schaefer, of the Czech German Chamber of Commerce, who adds: “Most (German) politicians realize that when a company invests abroad, it helps save jobs in Germany.” Oftentimes, an inexpensive plant in the Czech Republic may be the only thing keeping its German cousin afloat. Indeed, all bets are on Germany’s interest in the Czech economy to grow dramatically in the near future. Even with little left to pick up through privatization, existing investments will likely swell. The key factor is imminent EU entry, slated for 2004. As part of its annual survey, the Czech German Chamber of Commerce recently asked members how EU entry would affect their presence here. Schaefer says that, “by a wide margin, companies said they will increase it.” This is due mainly to diminishing concerns about legal stability. 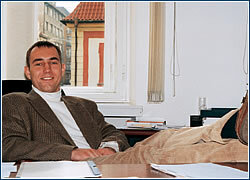 As Schaefer observes, “the Czech Republic in the EU means that the rule of law will be enforced.” This economic development means that the fates of the two nations will become more solidly intertwined, perhaps more so than any others in Europe – Germany now accounts for a dramatic 36% of all Czech foreign trade. This is perhaps an unlikely formula for two countries with a mutual history checkered by animosity and mistrust. As German investment becomes even more commonplace, there is hope that not only historical mistrust but also some inimical flaws will fade away. Chief among them, claim many observers, is a tendency among Germans to try too hard not be stereotypically imperious managers. The effort to be low-key and unobtrusive, says Deloitte & Touche partner and analyst Pavel Stehlík, can be a detriment: “they do not act like German occupiers…and as a result they lose a lot of opportunities. They could make changes a lot faster than they do.” Andreas Schaefer agrees, but is quick to point out one sensitive area where this behavior works best – in the media. Nearly all of the Czech news media, including national leading dailies, are German-owned. Yet as a rule, the foreign investors steer clear of day-to-day management decisions. And that, says Schaefer, makes everybody more comfortable. 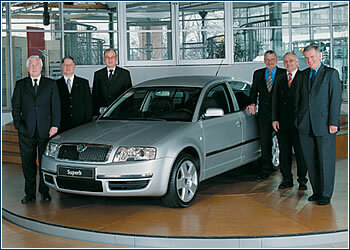 Since being bought by Volkswagen in the early 1990s, Škoda Auto has more than doubled sales to roughly 450 thousand cars annually. With the release of the Superb last year, company PR gushed that a return of luxury sedans created a direct link to the firm’s glory days in the ’30s and ’40s. The reverie was interrupted by a cold dose of corporate reality in October of this year. VW Chairman Bernd Pischetsrieder made no secret that VW’s new strategy, adopted in light of weak results of late, would involve a deeper differentiating amongst the family’s brands. Škoda, along with Seat, will now be marketed more clearly as a low-end car, while VW and Audi will be pushed as executive-class models. The main problem seems to have been that Škoda, once a laughable little product from the East, was cannibalizing VW’s own sales. Communication is likely clear between Škoda director Vratislav Kulhánek and his German board of directors, and the VW head office in Germany. So why are different people saying different things in public? Jaroslav Černý, spokesman for Škoda Auto, denies Škoda has been cutting in on its owners’ sales. “We draw our customers not from VW, but from outside of the concern,” says Černý. But evidence overwhelmingly indicates otherwise. “It’s really been reflected that VW is quite concerned about substitution – they’re looking to reduce that level of cannibalization,” says Tim Armstrong, auto analyst for eastern Europe with Global Insight. “There is a shift in long term strategy for Škoda – they’re looking at reducing its up-market potential, making sure that VW is clearly higher.” The local team can’t be happy about being handed the ignominious title of low-end producer – especially when a hint of class had just been restored to the Škoda name. The final privatization round of Czech banks featured one striking anomaly: where were the Germans? For a group that, in terms of foreign investment, seems to have fingers in just about everything else, it seemed odd it should sit back while Belgian, French and Austrian players snapped up the biggest retail banks in the land (ČSOB, Komerční banka and Česká spořitelna, respectively). “It’s safe to say,” according to Jan Slabý, analyst at Wood & Company, that Germans missed out. Costs were also taken into consideration on the part of German banks. “The prices that have been paid for banks, in our opinion, are too high to be justified if you have other possibilities for growth. The cost in reshaping the institutions must have been considerable as well,” says Dallosch. Still, cracking the retail market is something almost all banks here are now trying to do, as wages and general financial awareness grows – Commerzbank included. It will simply have to do so independently. It raised eyebrows last winter when German utility company RWE stepped up and handed the Czech government a very handsome sum for Transgas – some CZK 133 billion. RWE spokesman Andreas Brabeck calls it “a reasonable price.” Deloitte & Touche partner and analyst Pavel Stehlík agrees, citing the acquisition as a sound bit of strategy. According to Stehlík, who handled consultation with Transgas during pre-privatization: “the acquisition of the Czech gas sector was critical (for RWE) for two reasons – first, closing the gap in size, and second, growing their gas business, because they were much stronger in energy than in gas. It was important to have a second leg as big as their first one. And the last thing is it was important for them that they got access to Russian contracts.” Having those contracts will enable RWE to better manage risk, allowing it to opt for gas from either Russia or its former supply in the North Sea. Additionally, the fact that RWE supplies the city of Prague with energy through its stake in PRE creates interesting opportunities for gas/electricity synergy.